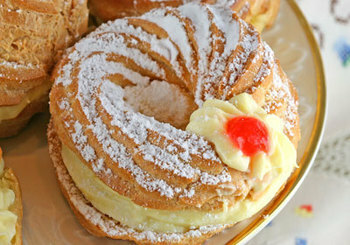 The traditional dessert for St. Joseph's Day is a cream puff known as Sfinge di San Giuseppe. To make your puffs, combine flour, butter, water, salt, and sugar in a saucepan and bring to a boil. Cook and stir until the mass leaves the side of the pan. Add eggs one at a time, beating well after each addition. Add a little grated orange and lemon peel. Drop by tablespoon on a baking sheet; bake at 400° F. for 10 minutes and then reduce heat to 350° F. for another 25 minutes. Stir until smooth the ricotta, chocolate, sugar, a little grated orange peel, and a generous dash of crème de cacao and use this to fill your puffs when they have cooled. Can be sprinkled with Powder Sugar and add a Marshino Cherry for decoration as options.